The Shure MV88 is a professional quality condenser microphone which plugs directly into an Apple® iOS device using a Lightning® connector. 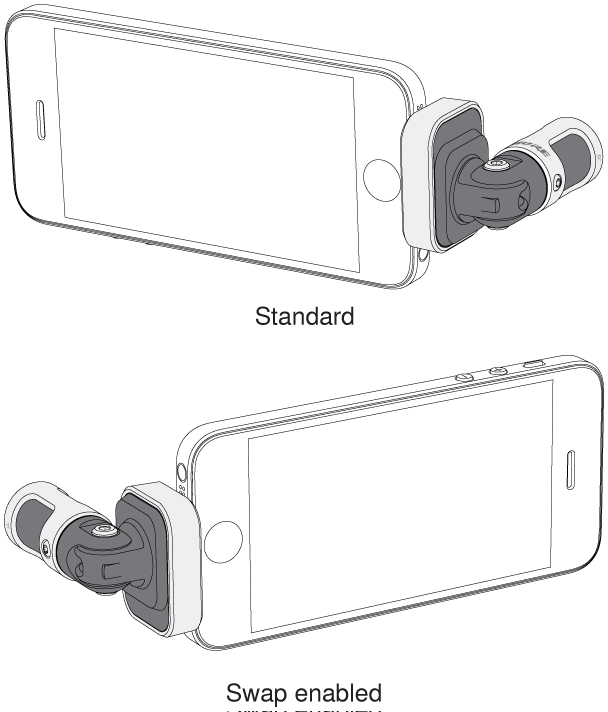 Two microphone capsules are arranged in a Mid-Side configuration to provide an adjustable stereo image, suitable for capturing a variety of sources, including music and speech. The ShurePlus®MOTIV app allows users to customize the sound with digital signal processing (DSP) preset mode selection, gain adjustment, and stereo width control. 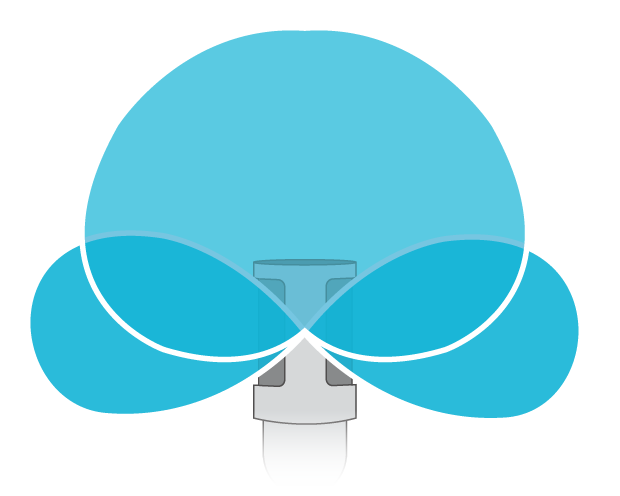 The classic mid-side stereo microphone technique uses two coincident capsules: one cardioid pointed directly at the source, and one bidirectional aimed toward the sides. This configuration allows the user to adjust the stereo width and provides excellent mono compatibility. The MV88 is compatible with any iOS device equipped with a Lightning connector. The MV88 features lightweight, all-metal construction and is small enough to carry anywhere. Like all Shure products, the MV88 ensures reliability in the field. The MV88 is compatible with mobile devices that have a Lightning connector. Plug the microphone into the Lightning connector on the iOS device. The LED on the MV88 base illuminates when an audio application or the ShurePlus MOTIV recording app is open and recognizes the MV88. Note: The reversible Lightning connector allows the MV88 to be installed in either orientation. Install and open the ShurePlus MOTIV app. 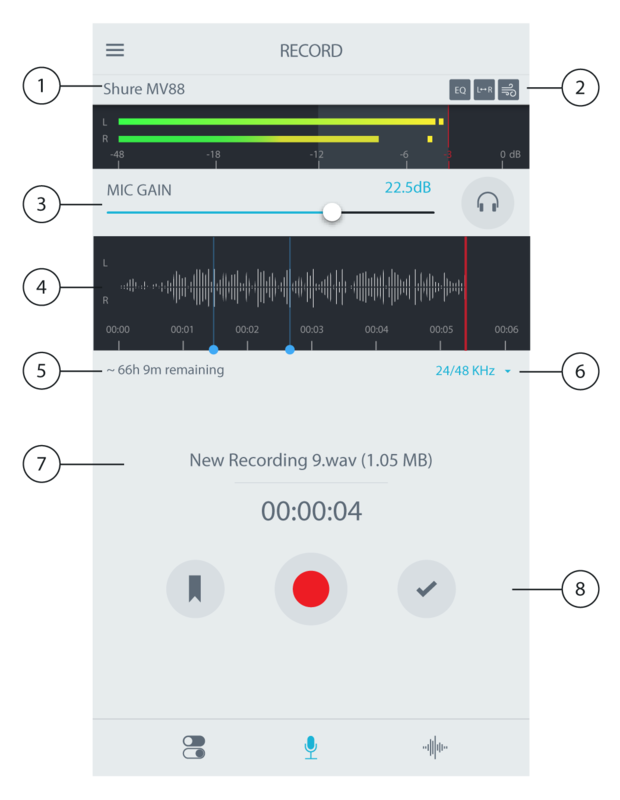 The app controls the microphone settings and provides instant recording capabilities. Check audio and adjust MV88 settings with the ShurePlus MOTIV app. Select a preset mode or manually adjust mic gain and stereo width to optimize audio recordings. See the "Aiming the Microphone" topic for mic placement information and "The ShurePlus MOTIV App" for information on audio settings like compression, equalization, and more. Set your device to Airplane Mode and Do Not Disturb before recording. This allows you to record with no audio interruptions from phone calls or app notifications. Press the Record button to begin recording. The microphone will retain settings from the last time you used the ShurePlus MOTIV app. Adjustments can be made while recording, but test settings prior to recording to avoid audible artifacts. The MV88 features two capsules: one capsule has a cardioid pattern and picks up sound directly in front of the microphone. The other is bidirectional and captures sound from the left and right sides. 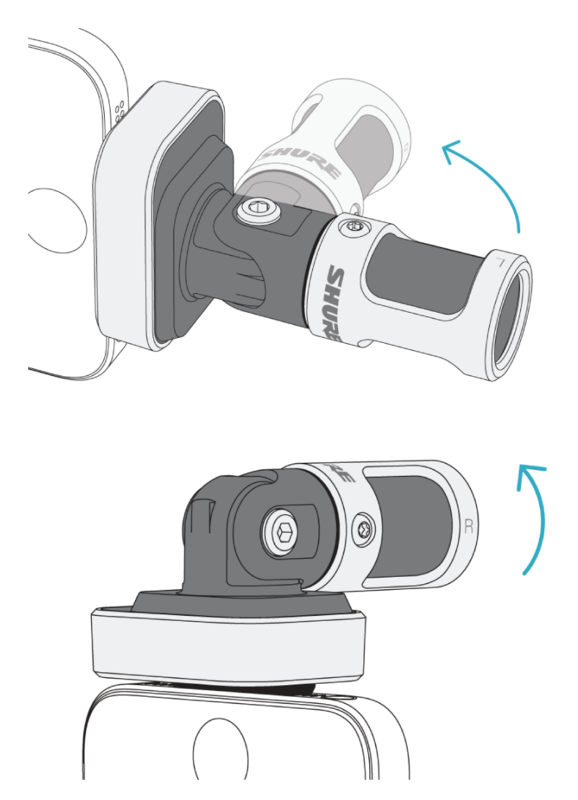 For accurate stereo recordings in any position, the front of the microphone must be pointed toward the sound source, with the sides facing the appropriate orientation. Use the L and R indicators on the microphone barrel to ensure correct placement. The microphone pivots and the barrel can be rotated 90 degrees to achieve desired positioning. Note: The Left-Right Channel Swap feature allows you to switch orientation on the microphone if the swap is necessary. This section suggests microphone placement for typical use cases. Keep in mind that there are many effective ways to record a given source. Experiment with microphone placement and settings to find what works best. Tip: To ensure correct stereo orientation of the microphone at a glance, check to see if the Shure name is clearly visible on the top of the microphone. If the name is not visible, turn the barrel 90°. The phone or tablet can be used in any position. Aim the front of the microphone toward the source, with the left and right sides facing the appropriate directions. Aim the front of the microphone toward the source. The microphone can be mounted in either orientation of the MV88 with the Lightning connector, so ensure that the left and right sides are facing the appropriate directions. Aim the front of the microphone toward the source. The microphone can be connected in either orientation with the Lightning connector, so ensure that the left and right sides of the MV88 are facing the appropriate directions. Set the recording device on a flat surface with one side of the microphone pointed toward the subject and the other pointed toward the interviewer. Select the MONO BIDIRECTIONAL preset in the ShurePlus MOTIV app. To capture the voices of both the subject (on-camera) and the interviewer (off-camera), select the MONO BIDIRECTIONAL preset in the ShurePlus MOTIV app. Position the microphone with the left and right sides facing each person. Set the device on a flat surface and angle the microphone toward your mouth. Select the MONO CARDIOID preset in the ShurePlus MOTIV app to reduce ambient noise. You require a slimmer connection to the headphone input on your recording device. The cable accommodates headphones and earphones with larger connectors. You want to disable the inline microphone on your headphones. The cable ensures that the recorded sound comes solely from the MV88 and not the headphone inline microphone. The ShurePlus MOTIV app controls microphone settings to optimize performance for specific uses. The MV88 stores the previously used settings for quick setup each time you record. Tip: Turn on Airplane Mode and Do Not Disturb to prevent interruptions to the recording caused by phone calls, text messages, or alerts. Use the navigation bar to quickly access Mic Setup, Record, and My Recordings. Select the menu to access general app settings and the About window for version information. Displays the strength of the input signal and whether that signal is mono or stereo. The loudest peaks should reach within the target range (indicated by the shaded region between -12 and 0 dB). Select a mode to set stereo width, equalization, and compression for specific applications. Refer to the "Preset Modes" topic for more details. Adjust to slider to match the volume of the sound source. Tap the headphones icon to monitor the input when making adjustments. Levels are in the target range when they peak in the shaded region of the input meter. Swipe to choose between Stereo, Mono Cardioid, Mono Bidirectional or Raw Mid-Side pick-up patterns. Then adjust the width of the stereo microphone pickup area. Tip: Consider the location of the microphone and the size of the sound source when adjusting the width. For example, a large orchestra or ensemble recording will benefit from a wide stereo image to achieve increased separation between instruments. Other applications, such as speech, benefit from a narrow width for improved clarity with rejection of ambient (room) sound. Fine tune your audio recording with limiter and compressor controls, wind reduction, left-right swap, and equalization settings. Tap to access Mic Setup, Record, and My Recordings windows. Five selectable modes optimize settings for gain, stereo width, equalization, and compression to match your recording needs. Set the microphone level and try the modes to find which sounds best. Then adjust level if needed. Speech Ideal for capturing speech Narrow stereo width to reject background noise, equalization emphasizes clarity and fullness, and compression is gentle to keep levels consistent. Singing Use to capture solo or group vocal performances Medium stereo width with subtle equalization to add richness and clarity for a natural sound. Flat Suited for any application An unprocessed signal (no equalization or compression settings used). Adds flexibility when processing the audio after recording. Acoustic Suited for acoustic instruments and quiet music applications Medium stereo width with transparent compression to smooth out volume spikes and bring out quiet passages. The equalizer setting emphasizes detail and an overall natural sound. 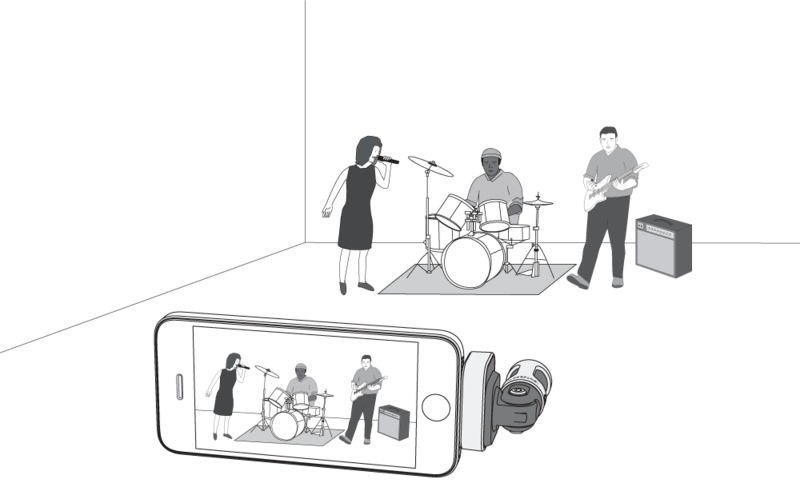 Band Use to record bands and louder sources Wide stereo to increase separation between sources. Equalization further improves definition by reducing frequencies that can make the instrumentation sound crowded. The following settings control microphone capsule activity. When operating in a mono mode, stereo width is not adjustable. Refer to the "Raw Mid-Side Output" section for information on output and processing. The Raw Mid-Side setting is intended only for use with audio recording applications that have a mid-side stereo matrix decoder to interpret the recorded tracks as a stereo image. Extract the left and right audio signals from the 2-channel Raw Mid-Side file as individual mono tracks. First track Use the audio signal (front/cardioid) from the left channel only as a mono track, panned to the center. Second track Use the audio signal (side/bidirectional) from the right channel only as a mono track, panned all the way to the left. Third track Copy the side/bidirectional signal from the second track. Pan this track all the way to the right and reverse the phase. Group the side tracks at the same volume level so they can be adjusted simultaneously. Increasing the volume of the side tracks increases the stereo width, while decreasing their volume narrows the width. Advanced tip: Using compression with a fast attack setting on the side tracks keeps transients (the first part of a sound, such as when a drum stick strikes a cymbal) toward the center of the stereo image and allows them to expand within the stereo field as the sound decays. 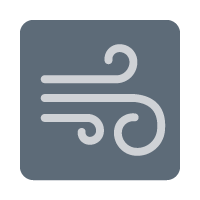 Wind Noise Reduction engages a low-frequency cutoff filter that reduces rumble caused by environmental noise. Use the included foam windscreen in combination with wind reduction to counteract rumble and plosives (bursts of air hitting the microphone). To further reduce wind noise, use the optional Rycote™ Windjammer, which fits over the included foam windscreen. When recording in stereo, this feature flips the left and right audio channels to correctly match the stereo image to the video. 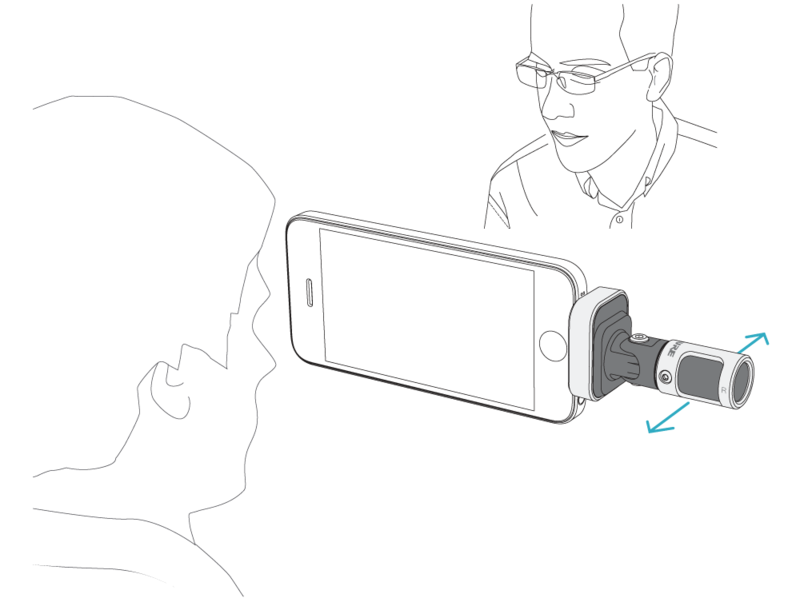 This may be necessary for certain positions where the microphone is reversed, for example, when using the MV88 and iOS device to video yourself. 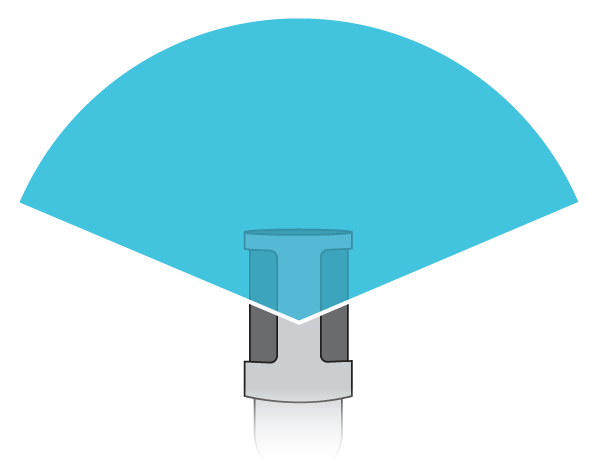 Tip: look at the L and R indicators on the microphone barrel to determine if the swap is necessary. 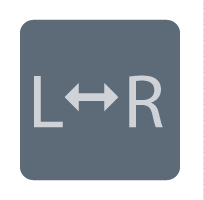 This way you can set LR Swap before you start to record. In this example, left/right swap should be enabled when the phone is rotated. 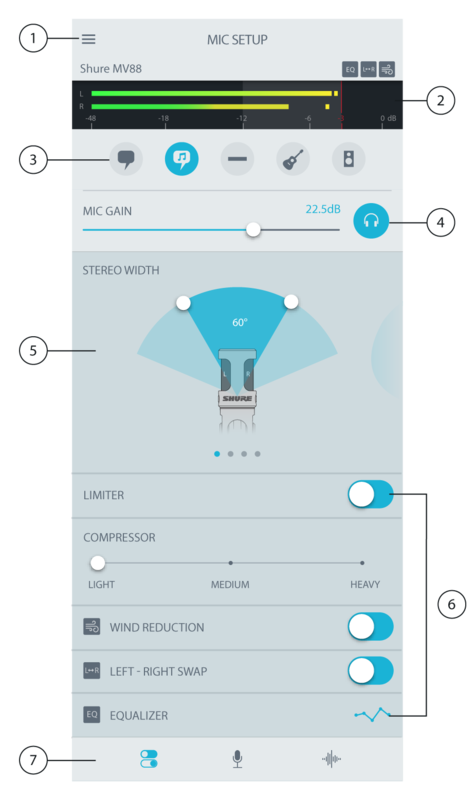 Mic Setup in the MOTIV app allows you to fine tune your equalizer, limiter, and compressor settings. Change the preset modes to hear the DSP changes, and adjust individual settings to dial in your sound. Note: Equalization within presets will not be displayed. 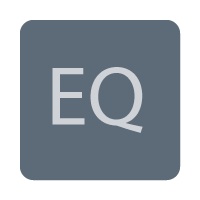 However, the EQ icon in the Mic Setup screen displays user-selected equalization. Tap Record on the navigation bar to access the record button and timeline. Status will display the model name of the connected MOTIV device. Displays the icons for the advanced settings currently enabled. Adjust to match the volume of the sound source. Monitor the meter when making adjustments to ensure levels are in the target range (indicated by the shaded region of the input meter). Displays the waveform of the sound while recording. Stereo Recording: A complete waveform is shown. Mono Recording: Half of the waveform is shown. Displays the available record time remaining on your recording device. Use the drop-down menu to select your bit depth and sample rate. Refer to the "Bit Depth and Sample Rate" topic for more details. Displays the name, file type, and size of the current recording. The Marker button, a Record/Pause button, and the Done check mark button. Note: The maximum file size for a recording is 2GB, which will result in approximately 2 hours of record time. This limitation was put in place to maximize app performance. Continuous recording for more than 2 hours will generate a second file. Find the Bit Depth and Sample Rate settings in the drop-down menu on the right side of the record window. Select a lower sample rate when it is useful to have a smaller file, for example, when recording speech or a podcast for download. Select a higher sample rate for music and dynamic recordings. If no alternate is selected, MOTIV will record audio at 24/48 kHz. However, the following bit depths and sample rates are supported. Turn On Airplane Mode and Do Not Disturb. When you plug a MOTIV device into your iOS device, a warning message prompts you to enable Airplane Mode and Do Not Disturb mode. It's important to do this to avoid recording interference from phone calls, messages, and various notifications. Tap X to dismiss this warning message. Note: Leave Airplane Mode off to add geolocation information to your audio file. Record in mono to increase your available record time or when recording a single source, like vocals, that would benefit from less ambient noise. Select the Mono Cardioid or Mono Bidirectional polar pattern and audio from all capsules are summed to a single channel. The input meter will indicate mono recording by displaying the top half of the waveform. MOTIV supports third-party microphones with mono recording. The MV88 barrel pivots forward on a hinge and rotates 45 degrees to accommodate portrait or landscape recording. L and R are labeled to show stereo orientation of the microphone. 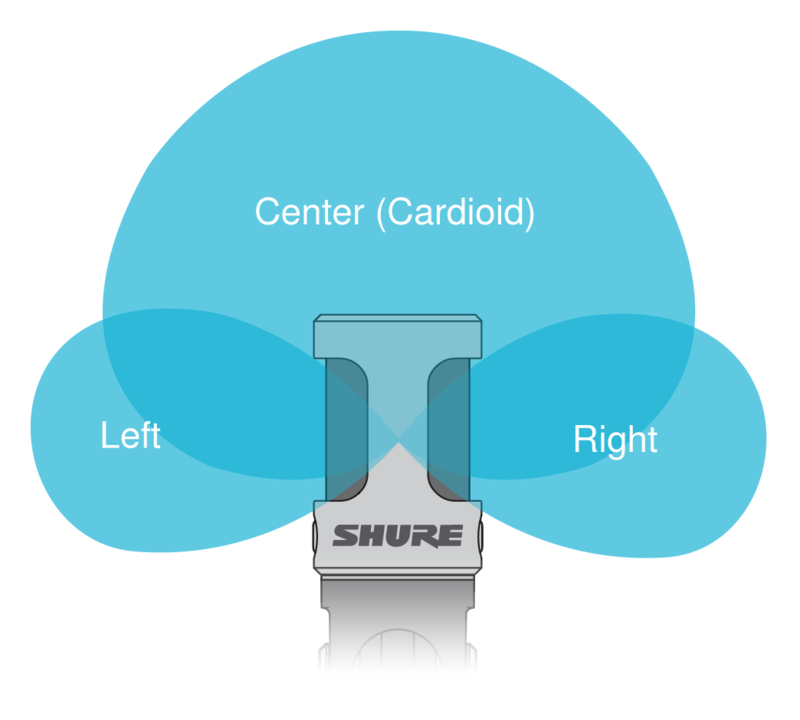 The stereo image is accurate if the Shure logo is facing upward. Select the Dark appearance option to change the app from light gray to dark gray. The darker display is ideal for discreet recording in low-light situations. You can access the Dark setting by going to Menu > Settings > Appearance > Dark. To ensure that you capture the entire sound source, start your recording before the performance starts and edit the recording later to trim any silence. Note: If your microphone accidentally becomes disconnected during recording, MOTIV will automatically stop the recording. The save file dialog will appear, prompting you to name and save your audio. Select the Keep Awake While Recording option so you can continuously monitor gain levels during longer recording sessions without the screen going dark. You can access the Keep Screen Awake option by going to Menu > Settings > Keep Screen Awake During Recording. Note: Disabling sleep mode will affect battery time while recording. Tap My Recordings on the navigation bar to play and edit your recorded tracks. 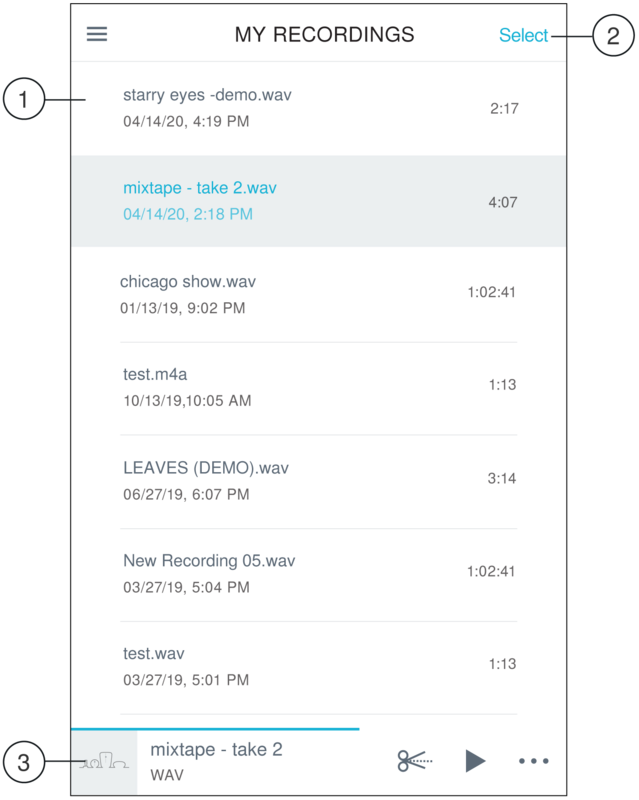 Displays your list of recorded tracks. Use the Select button to choose one or multiple recordings to convert, share, or delete. Tap the Edit icon to access the Editor. Play and pause recordings. Tap the three dots to access renaming, sharing, audio conversion or delete options. ShurePlus MOTIV allows you to convert, share, or delete multiple files at a time. Only WAV files can be converted. Tap Select in the top-right corner of My Recordings. Select all the files that you want to convert. A blue check mark will appear next to selected files. Tap Save As to display conversion options. Converting the files adds the new files to the My Recordings list. Double-tap the track name in the audio player to access the Playback window. Information of the currently playing track is displayed, including title, file format, bit depth, sample rate, and whether the track is in stereo and mono. 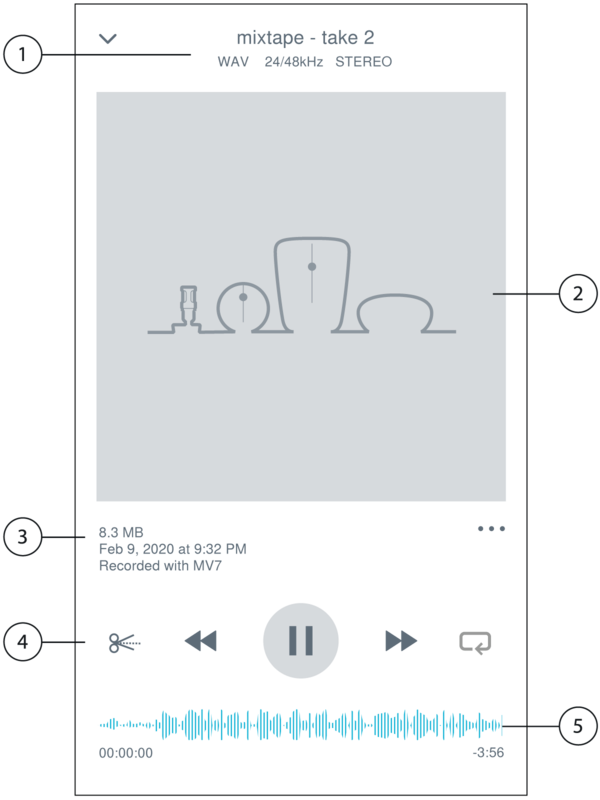 The MOTIV iconography accompanies your recording. Or customize the artwork when Saving to the Camera Roll in your iOS device. Refer to the "Customize Track Artwork" topic in the "Sharing MOTIV Recordings" section for more details. Displays the time and date that the track was recorded and the microphone that was used. See where you are in the track as it progresses. The time elapsed and time remaining are displayed below the timeline. Edit, Rewind, Play/Pause, Fast-Forward, and Loop your track. Tap Edit to access editing controls for each track. The MOTIV Editor allows you to polish your recordings before sharing them with friends or online. 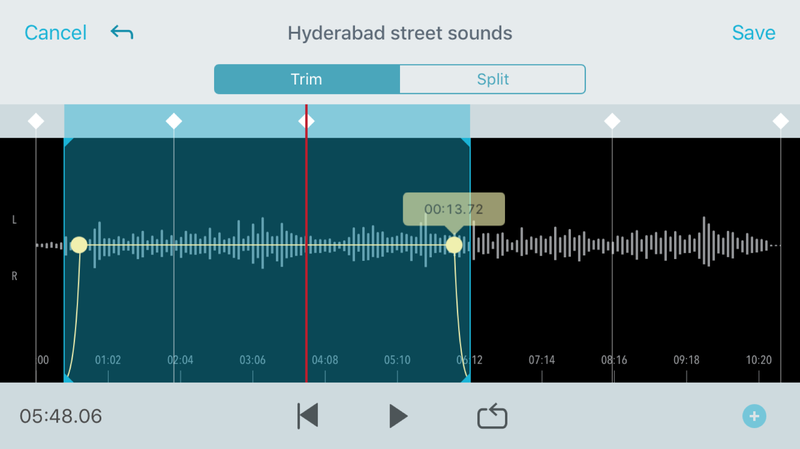 Split Mode allows you to split a long audio file into one or more separate tracks. This is useful when you've recorded a long performance and want to be able to listen to different sections individually. Trim Mode lets you trim the start and end of your recorded track. There are three ways to move around the timeline. Double tap the timeline to bring playhead to current view. Use the markers to move the playhead to a specific point. Tap and drag the red playhead bar to a new point in the timeline. Press Play to begin playback from that selected point. Pinch two fingers together to zoom out. Pinch apart to zoom in. Use Landscape mode in the Editor to view more of the waveform. Create a loop to isolate and repeat a selection of audio. Select the Loop button to select the entire track. The waveform in the highlighted blue area will be looped. 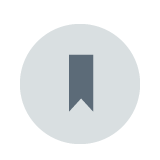 Select and drag the markers on the timeline to adjust your loop. Press Play to hear the loop and adjust until you find the best sound. 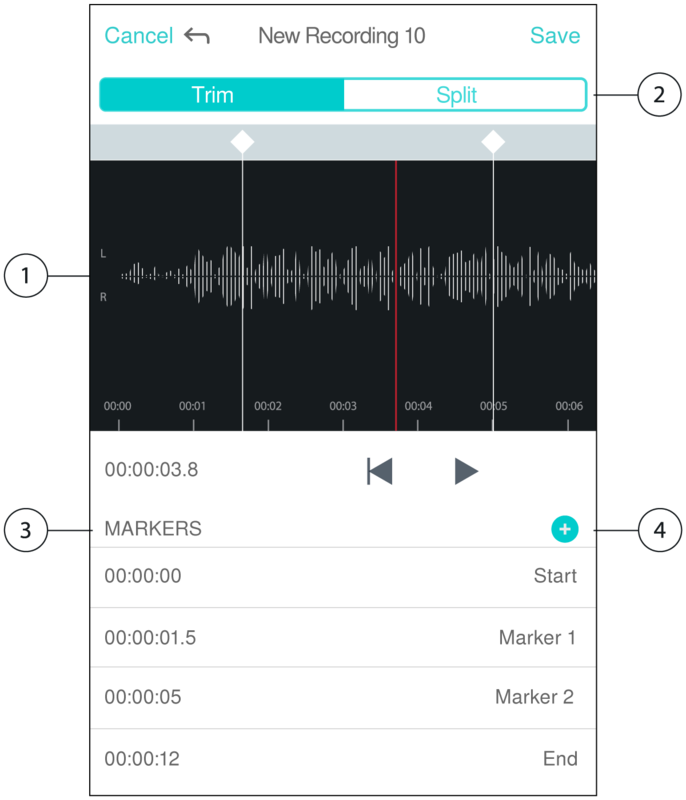 Markers are audio bookmarks that allow you to return to specific points in your recording. They do not affect playback start and stop points but are useful for reference. When used in Split mode, the marker placement determines the split point for the file. Markers are identified by hour, minute, second, and millisecond (00:00:00:00), however they cannot be placed closer than two seconds apart from one another. Adding a marker: Tap the Marker button to insert a marker at the playhead location. 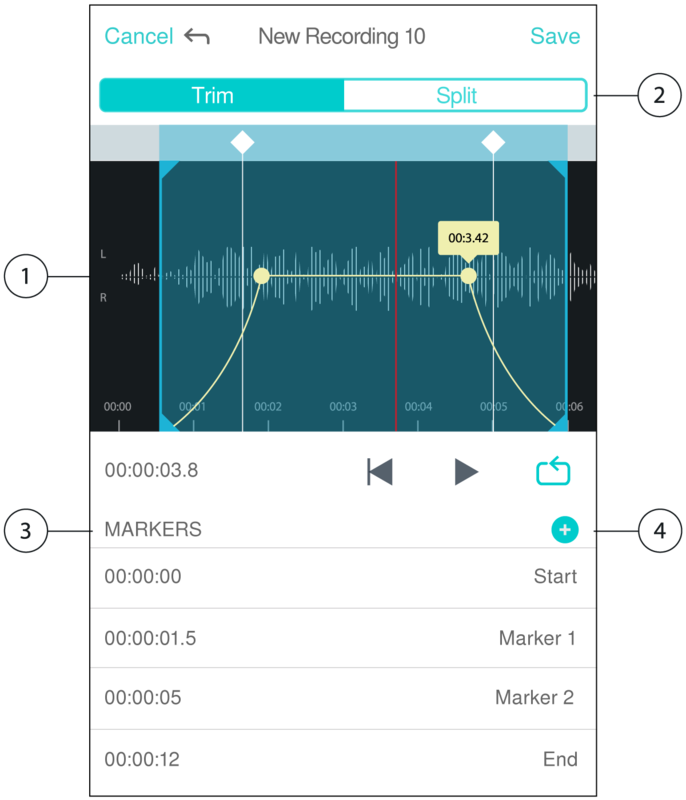 The marker list opens with Start and End markers for your audio track. Playback from a specific point: Tap any marker to begin playback from that marker point. Adding a marker: Press the plus sign to insert a marker at the playhead location. Moving a marker: Press and drag an existing marker to a new location on the timeline. Using the marker list: Tap the marker in the list to move the playhead to that location. Renaming markers: Press and hold the marker label in the list. Deleting markers: Swipe left on the marker in the list to reveal the delete option. See your entire timeline. Zoom in for precise editing. All recordings begin with Start and End markers. Refer to the "Markers" topic for more details. Click to add a marker at the playhead position. Trim mode is used to trim the extra space from the Start and End of your audio track. Go to My Recordings to select the audio file that you would like to edit. Select the Edit icon to open the Editor. The blue lines represent the Start and End points of your track. Select and drag the blue line to adjust Start and End times. Select Loop to have the loop play in a circle and allow you to hear your track before committing to edits. Tip: To undo the last action on your iOS device, just shake the device. You will receive a pop-up asking you to Undo the last action or Cancel. Loop, Rewind, Play/Pause, or Add Bookmarks to your track. Displays name and position in hours, minutes, seconds, and milliseconds. Use Split Mode when you have a long audio file that you'd like to divide into smaller audio files. Create new edited files while keeping your original file intact. Place a marker at the point where you want to split the audio. Keep the original file format or select a new one. MOTIV uses the file name but adds numbers to the names of your new, separated tracks. In Split mode, when you divide a track in half, My Recordings now displays three tracks. The original track remains intact and the first and second tracks that were created with the Split edit. Note: Double tap on the timeline to zoom in to a location. The closest possible zoom length is two seconds. After you reach the closest zoom, the double-tap will zoom out. 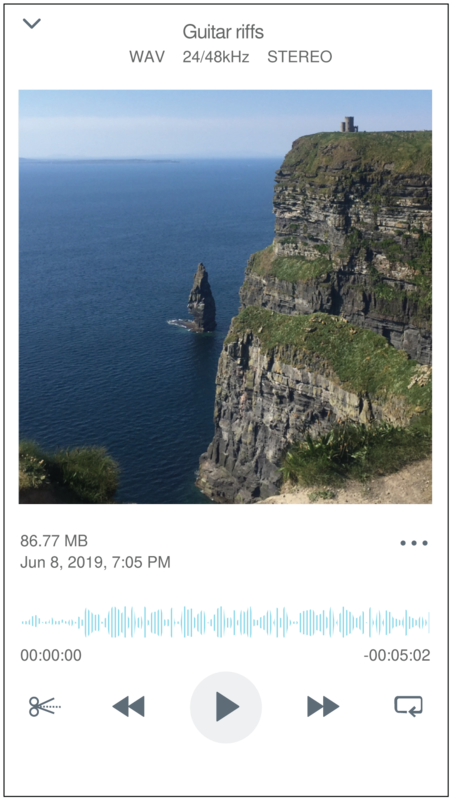 Convert your audio into a video file that can be easily shared to social media from your iOS device Camera Roll. In My Recordings, select the file you want to convert. Select Save to Camera Roll. The conversion will happen automatically. Large files will take longer to convert. Note: The first time you save to Camera Roll you will be asked to grant permission for file sharing between apps. If you accidentally dismiss permissions, you can always change access in the iOS device settings. Granting permission creates a MOTIV folder inside the Camera Roll. When the conversion process is complete, you will receive a notification letting you know that the save to Camera Roll was successful and your track is available for sharing. Saving your file to the Camera Roll gives you the option to add an image to your track. Tap the three dots underneath the MOTIV graphic and select Add Artwork. Choose an image from your Camera Roll. Save your MOTIV files to Dropbox to store backup copies, free up space on your iOS device, or share to social media. Open the MOTIV app and go to My Recordings. Tap the Select button to choose one or multiple files. Select share and choose Dropbox. Note: You may need to grant access between MOTIV and Dropbox. Selecting "Allow" creates a MOTIV folder inside Dropbox and links the apps. When the file successfully uploads, the file saved notification appears. Note: Large files may take longer to upload. Now that your file is uploaded to Dropbox, you can store backup copies of your recordings or share them on social media. 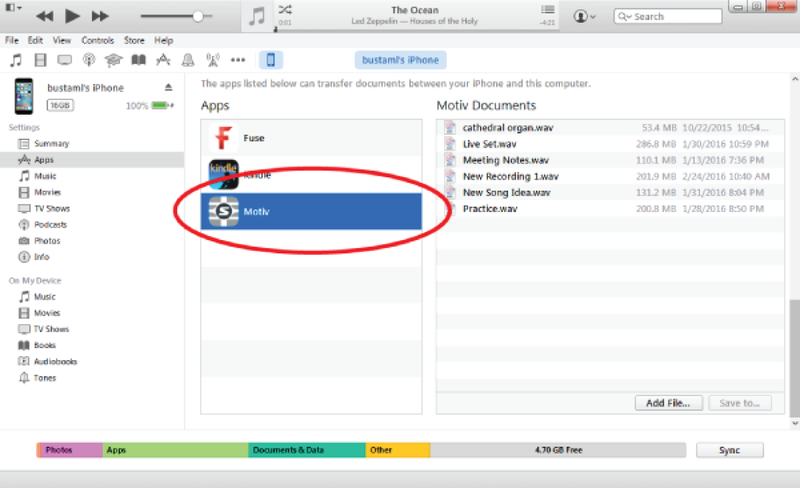 MOTIV supports the ability to AirDrop WAV files to selected contacts. Select Share and then More to see your AirDrop contacts. Use iTunes to easily transfer audio files between your desktop computer and iOS device. 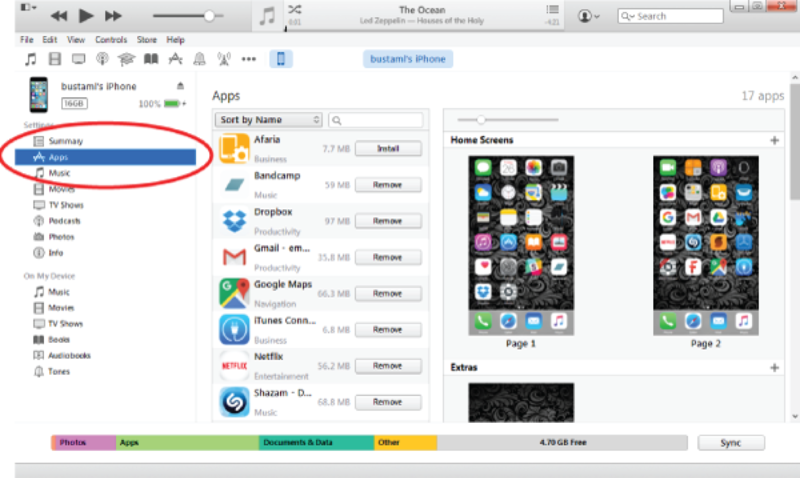 Connect your iOS device to a computer and open iTunes. Note: The most current version of iTunes is recommended. Select your device icon and then select "Apps" from the settings column. Select MOTIV from the file sharing section at the bottom of the screen. You might need to scroll all the way to the bottom using the far right scroll bar. This will display your MOTIV documents. 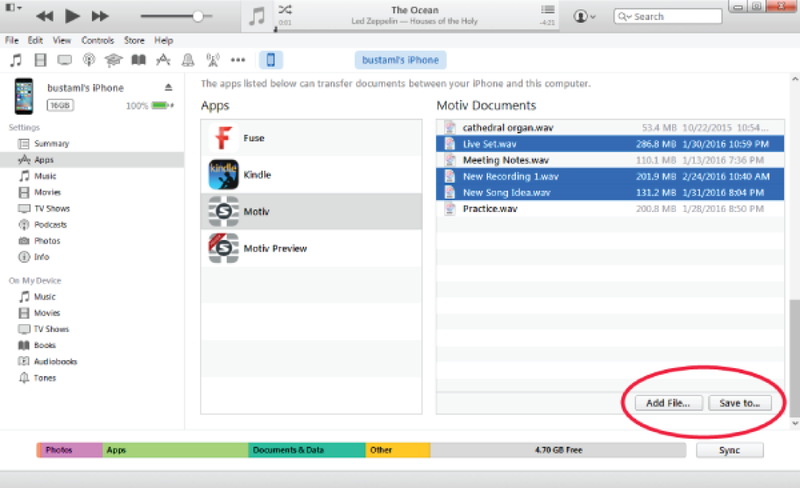 Highlight the recordings you'd like to save and choose the "Save to" button. Now that your files are downloaded to your computer you can add them to the iTunes library or import them into any audio editing program. Note: Use the add file button to upload audio from your computer to the MOTIV app. MV88 is plugged in, but the volume meter does not register a signal. Edit the privacy setting for your recording device under SETTINGS > PRIVACY > MICROPHONE to give the ShurePlus MOTIV app permission to use the microphone. MV88 is plugged in, but the microphone is not detected. Unplug and re-seat the microphone when the name of the microphone is not visible in the status bar. LED light on MV88 is not visible The LED is located at the base of the MV88. 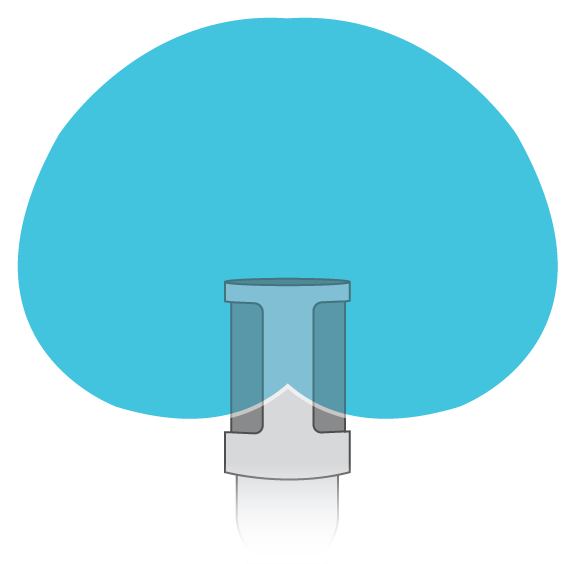 Because the Lightning connector allows you to insert the microphone in either orientation it is possible that the device is obscuring the LED. Remove the microphone, flip, and re-insert to check microphone status. Audio sounds bad or distant. To ensure that you are receiving audio from the MV88 and not a built-in microphone, unplug and reseat the MV88. The top left corner of the screen will identify the Shure MV88 when the microphone is correctly in place. Audio quality changes when a headset is plugged in Headsets with inline microphones can override the MV88 as the audio device. Use the included headphone monitor adapting cable to disable interference from other microphones. Make sure that you plug in your headset first and your MV88 last. Audio is distorted Use the audio meter to ensure that volume peaks are within the target range (the gray area). If the level reaches the red peak indicator of the input meter, turn the gain down. Left/right stereo channels do not match video Depending on the orientation of the recording device, it may be necessary to engage the Left-Right swap in MOTIV settings. If the audio has already been recorded, you can switch the left and right channels in most audio editing software. Measurement Mode disables automatic gain adjustment and low-end frequency roll-off to allow for more user control and more dynamic recordings. When the recording source is an analog input, Measurement Mode is enabled. When the recording source is digital, Measurement Mode is disabled. Analog inputs include the built-in microphone as well as an external analog microphone that is plugged in using the 3.5 mm jack, like the MVL microphone. Automatic Gain Control, or AGC, allows a mobile device to record signals of varying levels and maintains consistent playback volume. Weaker signals are boosted and stronger signals are attenuated to control gain. The dynamic range is decreased but the result is a more even recording. Note: The gain control is automatic in the iPhone 6S. Measurement Mode Enabled: ACG and HPF are off. Measurement Mode Disabled: ACG and HPF are on. iPad, iPhone, iPod, iPod classic, iPod nano, iPod touch, and Retina are trademarks of Apple Inc., registered in the U.S. and other countries. iPad Air and iPad mini are trademarks of Apple Inc. 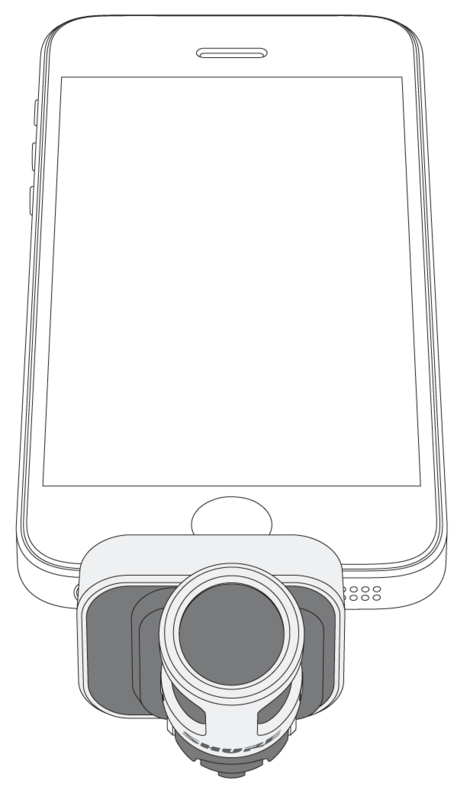 The trademark "iPhone" is used with a license from Aiphone K.K. Mac® and Lightning are registered trademarks of Apple Inc.
ShurePlus MOTIV is not affiliated with or otherwise sponsored by Dropbox, Inc.